When I am using Windows 8 and working on the desktop I don’t like to switch between the desktop and the modern interface very frequently. If I open a picture on the desktop I want the picture to open in the desktop image viewer. If I open a video while on the desktop I want the video to play in a window and not the full screen immersive player. An easy way to bypass the full screen immersive viewers is to set new default programs for the file types. Click on the Start Button, type in Default Programs and hit Enter. Select Windows Photo Viewer and then click Set this program as default. Select Windows Media Player and then click Set this program as default. After you have Adobe Reader installed, click on the Start Button and type in Default Programs and hit Enter. Select Associate a file type or protocol with a program. 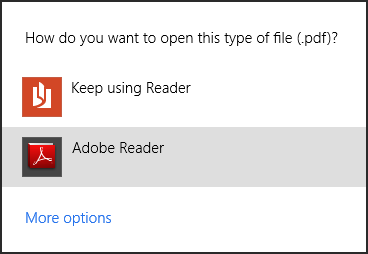 Select .pdf and then click Change program.